Dr. Neil Gupta, BWH Division of Global Health Equity. Ms. Stopa is a Clinical Research Regulatory Coordinator in the BWH Department of Neurosurgery, and holds a Masters of Public Health in Global Health. She is a contributor to the BWH Global Health Hub. 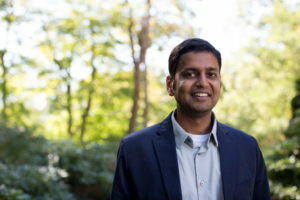 Dr. Neil Gupta is a physician in Brigham and Women’s Division of Global Health Equity (DGHE) who is working to strengthen healthcare systems by addressing the growing problem of noncommunicable diseases in low-income countries. I sat down with Dr. Gupta to discuss the scope of his work and the landscape in which he conducts these critical system-strengthening efforts. Ms. Stopa: Thank you for joining me, Dr. Gupta. I want to talk to you today about noncommunicable diseases (NCDs) and your work in addressing them. I read in the World Health Organization (WHO) report in 2015 that 70% of the world’s 56 million deaths were caused by NCDs1. And so, as somebody that works in that field, do you see NCDs emerging as the focus of public health? Is this the direction the field is moving? Dr. Gupta: NCDs are definitely an emerging focus in global health and are increasingly recognized as a critical issue that we need to address. NCDs, to give you an overview, are a diverse group of chronic illnesses that include cardiac conditions, cancers, respiratory diseases, diabetes, blood disorders, kidney diseases, liver cirrhosis, congenital diseases, and many other conditions. It can also include mental disorders and injuries, which may require surgical, rehabilitation, or palliative care services. In the global health community, NCDs are set apart from more traditional infectious diseases, which have historically been a major focus in global health. Infectious diseases cause a huge number of deaths, but luckily many can now be prevented or treated with adequate tools and resources. Addressing large-scale infectious epidemics, as well as basic maternal and child health services, was the first goal of emerging health systems in lower income countries globally. But now, as health systems and coverage of health services have improved in those areas, the area of NCDs is being increasingly recognized as the next step for maturing health systems.